Cate`s Place: Shaken` The Pom Poms! Thanks to Madame Samm for creating this fun Hop and to Thearica for keeping all us chickens moving in the right direction. This Poodle is cross stitched on a vintage gingham apron. I purchased the apron five years ago. After repairing the stitching and the open work I set the apron aside. When I stumbled on her again I knew a few pom poms would be cute. I made them with Coats Pearl Cotton, wrapping the thread around my fingers. Thank you for stopping by. Please visit the other participants at the links below. I know there are wonderful things to see. So cute, love the poodle! Poodles and Pom poms ... They just go together so well! Love how you added the pom poms to your vintage apron! Thank you for sharing. Very cute little poodle. Thanks for sharing today. The added pom poms really hightlight the poodle and make your vintage apron pop! Nice job! ahhh... I am crushing on that poodle! She is too cute! Cute poodle and pompoms. Thanks so much for sharing this. I love seeing new ways to use pompoms. I love this Cate...I was thinking this would be great as a kitchen curtain, that is what I thought it was till I read your post....really lovely..very vintage and very cute..
Cate that is such a sweet poodle! I have a few more blogs to visit, but I was surprised someone didn't make one of those felt poodle skirts from the '50's with pom-poms. Love this apron, nice work!! 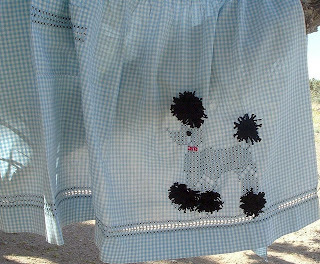 That little poodle would look so cute on a skirt, too! Love the pom pom additions on it. Your vintage apron and adorable poodle are perfect together! Great job! Oh, your pompom poodle turned out so cute! What a great addition to your apron! I like the retro poodle! Perfect! Love the vintage / retro look of the project. Great choice. How cute, Cathy! I wondered about making pom poms with something other than acrylic yarn so maybe I will try that next time with those itty bitty pom pom makers. THX for sharing. I love vintage linens! Oh I do remember those poodles. What a fun way to spice up an apron! Very nice poodle. I love how you used the gingham for it. Great idea for the pom poms. Cute!. I remember the poodles on skirts! A super sweet apron! Thanks for sharing! Your poodle is the perfect finishing touch to your apron! Hi!!!! Love the little poodle!!!! Perfect on your apron!!! Thanks for the fun!!!! Sweet! Love teh vintage look! It is aorable, thanks for sharing! Sweet!! A Poodle on an Apron!! Now you need a wool skirt in Blue with a Pink Poodle! !.....I had to have one to match my OLDER sister! !....with a can-can! Have a wonderful Day!! He looks like he belongs there. :) Cute. Your poodle looks right at home. Your apron reminds me of poodle skirts from the 50's! Oops, that's showing my age. Thanks for sharing your cute project. Such a cute apron. I loved those poodle skirts and it reminds me of that. I couldn't get away with wearing the skirt but an apron would be fine. I love old lines. Your poodle looks great. Wow! This is so unique and the poodle is just perfect on this piece! Oh my goodness...I am in LOVE with that poodle apron and the cute pom poms just made it even better. Well done. What a cute poodle. Love your apron. Oh how cute. I had a poodle growing up and never even thought of that. Course my poodle was a boy and we never gave him a poodle cut. Cute apron. Pom poms are so perfect for poodles. Thanks for sharing. That apron brings back so many memories. There was a time growing up where those gingham checked aprons were the "thing". Everyone did special cross-stitch embroidery on them. Yours looks so cute with the poodle and the poms. -that is a very cute idea, so-o-o lovely!